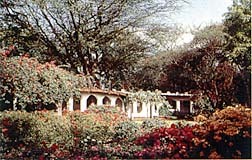 On the shores of Lake Baringo, 285 kms northwest of Nairobi, Lake Baringo Club nestles amongst palm trees, green lawns and the clashing pinks, purples, reds and oranges of bougainvillea obviously thriving in the hot steamy days that characterise so many of the Great Rift Valley's lakes. Mirroring the surrounding Tugen Hills and Laikipia Escarpment, the lake owes its chocolate colour to the rivers that feed it - all carrying plenty of top soil. Hippo and crocodile share this watery residence with tilapia, mud fish, bass cat fish and an enormous variety of birds. There is never a dull moment at the Club. Morning and evening bird walks, always accompanied by our resident ornithologist, give visitors the opportunity to see several magnificent birds of prey, noisy, restless 'bush' birds and the numerous species frequenting the shore. There are plenty of small motorised boats for hire, all captained by knowledgeable bird enthusiasts. And there is so much to see on the Lake - hippo and crocodile at close quarters, a bejewelled assortment of kingfishers, local fisherman sorting the day's catch, and of course the scenic beauty of a Rift Valley Lake. Our daily visit to a local tribe's manyatta (village) is always popular with guests. The Njemps are related to the Masai and Samburu and speak a similar language. Daily chores continue despite the presence of visitors - happy, plump children carrying gourds of water almost larger than themselves, several scrawny dogs scavenging in the dirt, goats and cattle vying for space in the compound, heavily beaded women sorting millet and the head of the household, sitting majestically on his stool, enthralling the younger members of the family with the stories of yester-year. The lovely gardens of the Club are a pleasure to behold and the swimming pool, surrounded by clusters of exotic shrubs, attract bathers throughout the day. 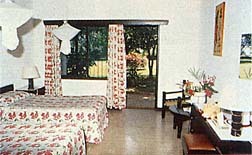 When you visit us, do allow enough time to enjoy our legendary hospitality in between the many excursions available.